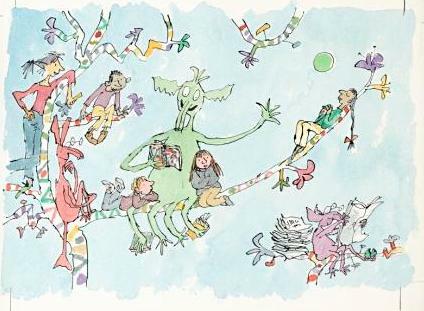 I blogged a few weeks ago about an exhibition of Quentin Blake’s paintings for hospitals and other health organisations. It is now in London, at the Foundling Museum. I loved it. This is just one of his fabulous Planet Zog pictures for a children’s hospital. I also particularly liked his paintings of ancient circus artists, created with elderly mental health patients in mind. They are delightfully funny, heart-warming and sympathetic. His artwork for an eating disorder clinic is also full of empathy and humour. There is a reading corner decorated with wallpaper designed by Blake (as is the wonderful café). The day I visited lots of children and adults were busy there producing art and stories inspired by the exhibition. Some great looking family events accompany the exhibition. Anyone with an iPad can download a free app with more about Blake’s work. The Foundling Museum is well worth exploring. It gives the history of the Foundling Hospital, the first home for abandoned children. Some of the stories are truly tragic. The museum does lots of impressive work with today’s looked-after children and young people.